Dr. Azza Kamel holds a PhD in Philosophy in Education. She is a women's rights activist who has a long experience in combating violence against women and enhancing women's rights. She is also a novelist and a writer. She worked with various Egyptian and Arab newspapers such as El Shouroqu, al thrier, Akhbar El Adab, El Massry El Youm, El Hidah and El Doha. She has developed and prepared various studies and researches on the image of both men and women in media. She prepared a study on "Women in the World Constitutions". She has also different literary writings on women's rights. She is the author of "Women in the constitutions of the world" book. She is the author of short stories titled:" Al Nahr Al Rajef", "Hareir El Torab", "Creators not to Watch". She is also the author of "Nassab" novel. Dr. Azza had been the chair of the Panel Committee of the Best Film Award on Women in Ismalia International Festival for six years (2008 : 2016). She was also the chair of the Panel Committee of the Foreign Films in Muscat International Film Festival during 2008. 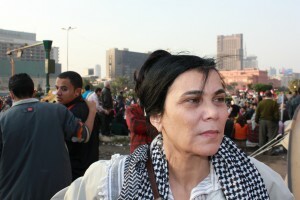 She is the founder of the Appropriate Communication Techniques for Development – ACT, a civil society organization that focuses on women's issues in Egypt and seeks to enhance the conditions of the Egyptian women. Through her center, Dr. Azza contributed to produce different documentary films on women's conditions in Egypt, especially violence against women. Furthermore, Dr. Azza established various non-governmental organizations and networks to work on women's issues. She is the founder of "Shoft Taharosh" (I saw harassment) initiative that aims to combat harassment phenomena. She is also the founder of the Arab Network to monitor and change the image of men and women in media. Dr. Azza is known for her prominent role after January 2011 Revolution by putting women's rights and issues on the political agenda in front of the Constitution's Committee responsible of developing Egypt's new Constitution. She contributed to enhance the capacity of various female candidates of both the parliament and local councils.